A Sambar thick with lentils and vegetables is a nutritious accompaniment for rice. But to relish Tiffins like Idlies, Dosaes and Vadais a thinner yet delicious version of Sambar is always preferable. Savouring the dishes dunked in a flavoursome and piping hot Sambar is a joy unparalleled ! I remember my friend's daughter virtually 'drinking' four cups of Sambar with one Dosae at a restaurant which was famous for its delicious Dosae and Sambar ! Here is how I make the 'Dunk in' Sambar ! or a mixture of all vegetables to make the Sambar more nutritious. 1. Heat half a spoon of oil and add cinnamon. 2. 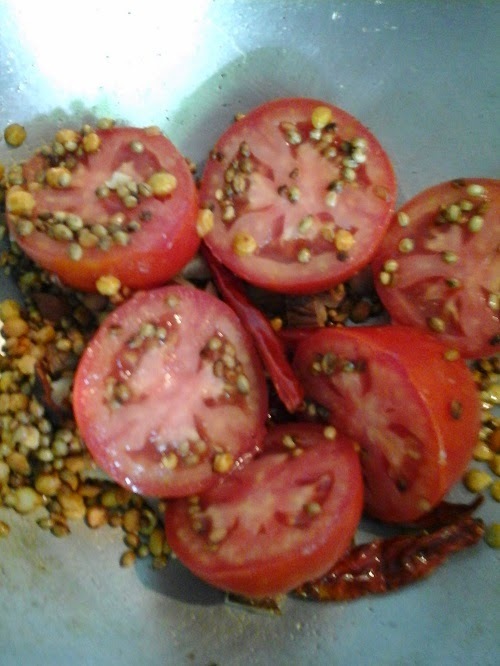 When it is fried add the Bengal gram dal, black gram dal, coriander seeds, fenugreek seeds and red chilies. Roast till the dals turn slightly golden in colour. 3. 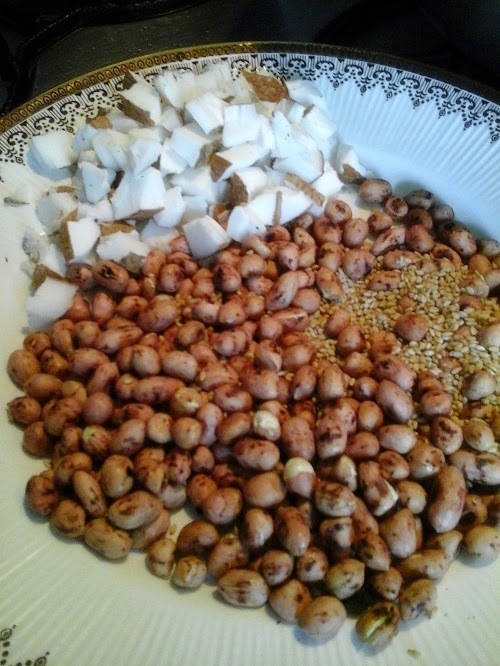 Add asafoetida followed by fresh coconut pieces or gratings. Roast till you get a very pleasant aroma. 4. Add the chopped tomatoes and cover and cook till they are tender. 5. Add the tamarind, switch off flame and allow to cool. 6. Cook the vegetables of your choice separately and keep aside. 7. 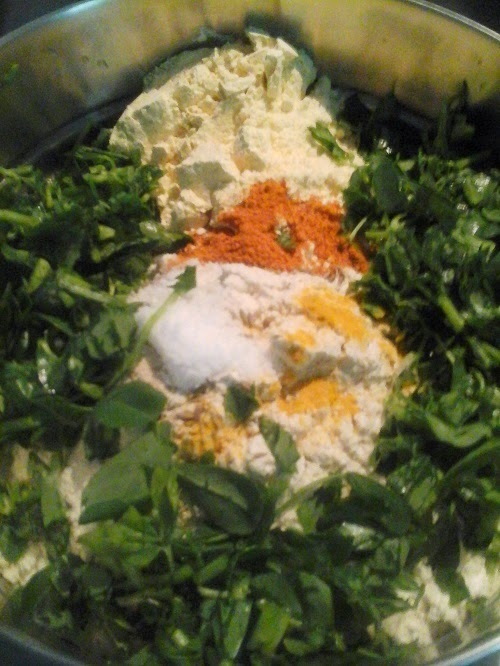 Blend all the roasted ingredients together into a smooth paste adding rice flour and salt. 8. Heat the remaining oil and add mustard seeds. 9. When the mustard seeds splutter add the curry leaves followed by chopped onion and cook till the onion turns pink in colour. 10. Add all the cooked vegetables and the ground paste along with 6 cups of water. 11. 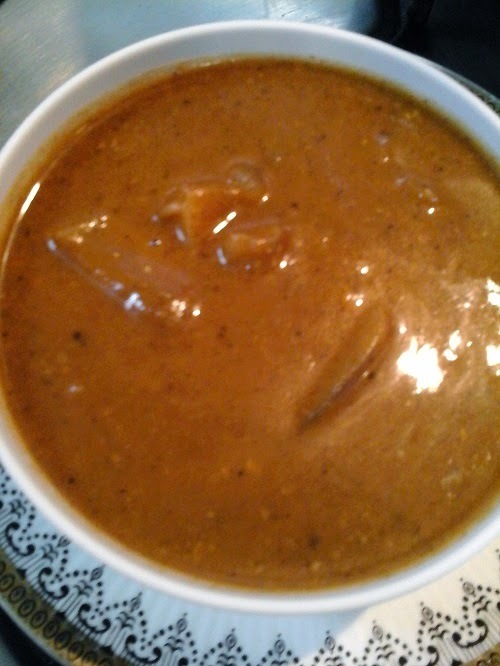 Stir in the jaggery and allow to simmer for five minutes . Now dunk your Idly, Dosai or Vadai pieces in the 'Dunk In' Sambar and enjoy ! Of late I have been hearing and reading a lot about Undhiyu . Undhiyu tops the list of the lip smacking dishes in the Winter Vegetarian Thalis of star hotels. I was flabbergasted at the list of ingredients that go into the making of this delicious Gujarati dish. Since I had used only half of the winter vegetables to make Yezhu Kari Koottu on Tiruvaadirai, I took courage and decided to try out this dish using the remaining half of the vegetables. Once I was ready with the ingredients and got the hang of it, cooking Undhiyu - which I thought was a very complicated job - became very easy. Precisely it involved only four steps ! 1. Mixing roasted and ground nuts with green chutney to make the masala. 2. Stuffing and smearing the masala into and all over the vegetables. 3. Pressure cooking the vegetables with Muthias. 4. 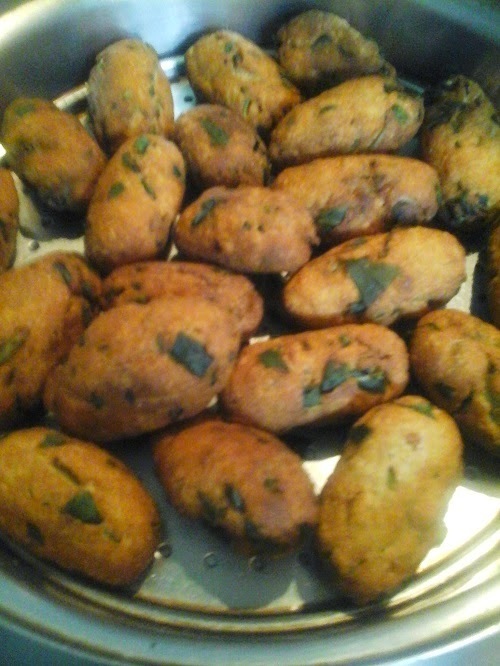 Finally relishing Undhiyu with more crispy Muthias ! That is it ! And now before moving on to the finer details of preparing Undhiyu, I have a small confession to make ! 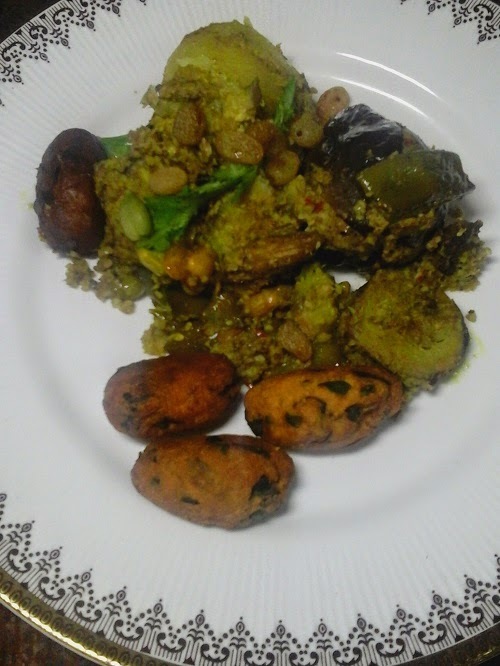 I have included the regional winter vegetables of Bengalooru - Avare Kaalu and Chapparada Avarekai - instead of the green Pigeon Peas and Surti Papdi traditionally used for preparing Undhiyu. I have peeled the banana, while traditionally the banana is used with the peel. 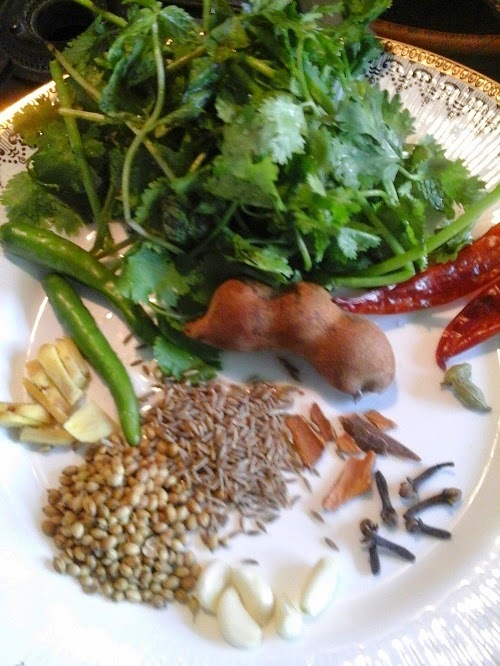 Tamarind and red chillies have been used to suit the taste of my family members. Sugar has been totally avoided. But still the out come was sumptuous and tasted delicious ! 2. Add 2 tbsps of oil and gather the ingredients together. 3. Sprinkle water as required and knead into a stiff dough. 4. Pinch plum size dough balls and shape them into oval rolls. 5. Deep fry the Muthias till golden brown, drain and keep aside. 1. Dry roast peanuts till they crack and keep aside. 2. 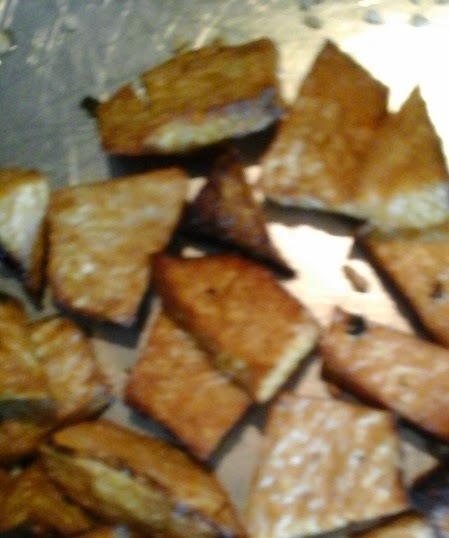 Dry roast sesame seeds separately. 3. Blend the nuts together coarsely. 4. Add the fresh coconut gratings and blend once more. Grind all the ingredients together into a smooth chutney. 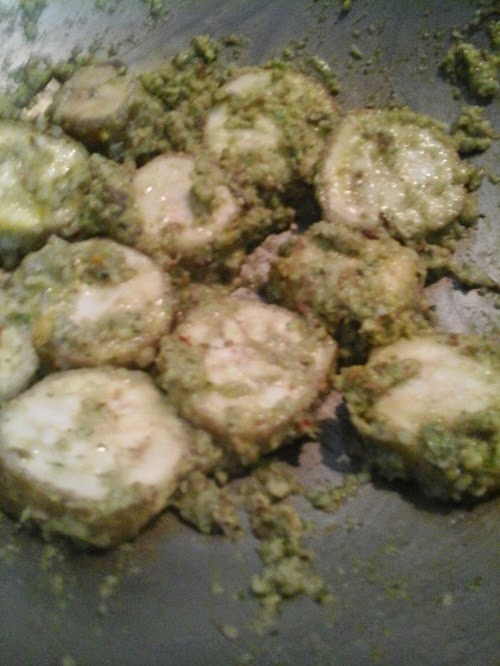 Mix the roasted and powdered nuts and the green chutney together. Now the masala is ready. 1. Slit the eggplants into four keeping the base intact. 2. Peel the potatoes and make four slits on each of them keeping one end intact. 3. Peel and chop the yam into medium size pieces. 4. Peel the banana and slice it into one inch thick pieces. 5. String the flat beans and cut each one into two pieces. 1. 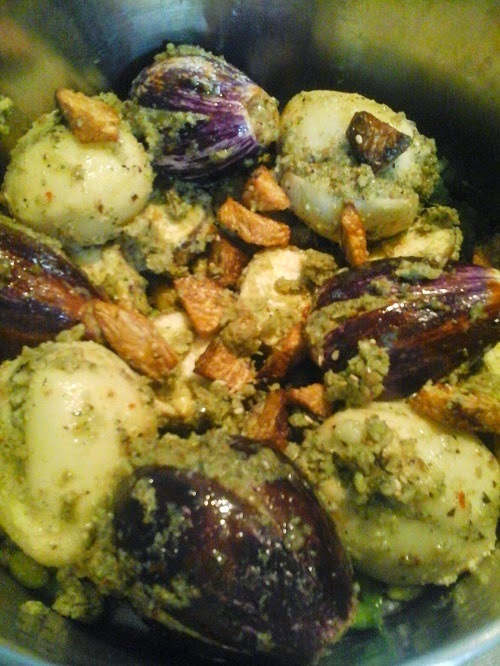 Take the prepared masala in a spoon and stuff in between the slits of the eggplants. 2. Similarly stuff the potatoes with masala. 3. Deep fry the yam pieces and keep aside. 1. Heat 1 tbsp of oil and add the mustard seeds. 2. Add cumin seeds followed by asafoetida and turmeric powder. 3. 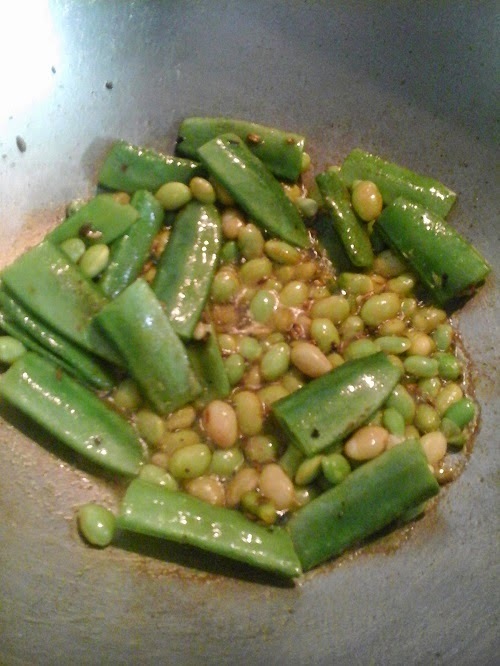 Add the Field beans ( Kaalu ) and flat beans ( Chapparada Avarekai ) to the seasoning, and cook for five minutes adding a pinch of salt and 1/4 cup of water. 4. 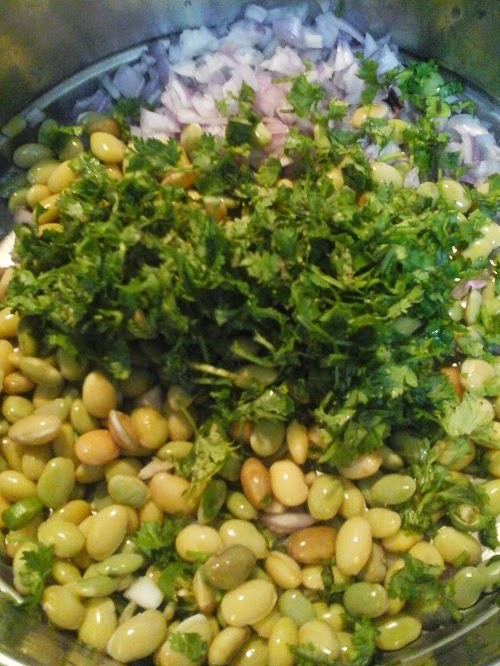 Remove the beans along with the seasoning and water into a flat bottomed vessel that will fit into the pressure cooker. 5. Saute the sliced banana in the same kadai adding little of the masalaa and spread them out on the beans. 6. Add one table spoon of oil into the kadai and saute the potatoes for two to three minutes so that they are well coated with the oil. 7. Place the potatoes over the banana slices. 8. 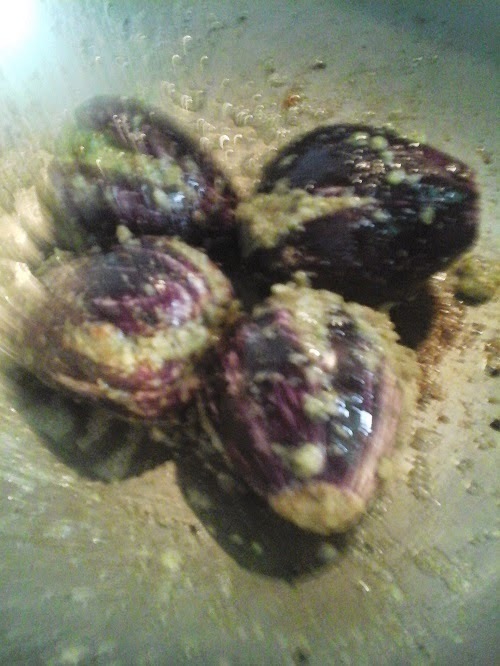 Again add 1 tbsp of oil and add the stuffed eggplants, and saute for three minutes. 9. 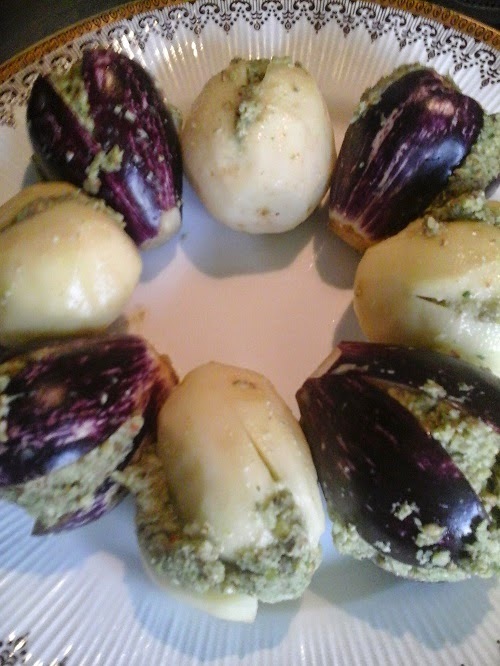 Remove and arrange them between the potatoes. 10. Arrange the fried yam on top and spread out all the remaining masala over the vegetables. 11. Throw in a few Muthias on top and pressure cook up to three whistles and switch off flame. 12. Open the lid after the pressure subsides. 13. 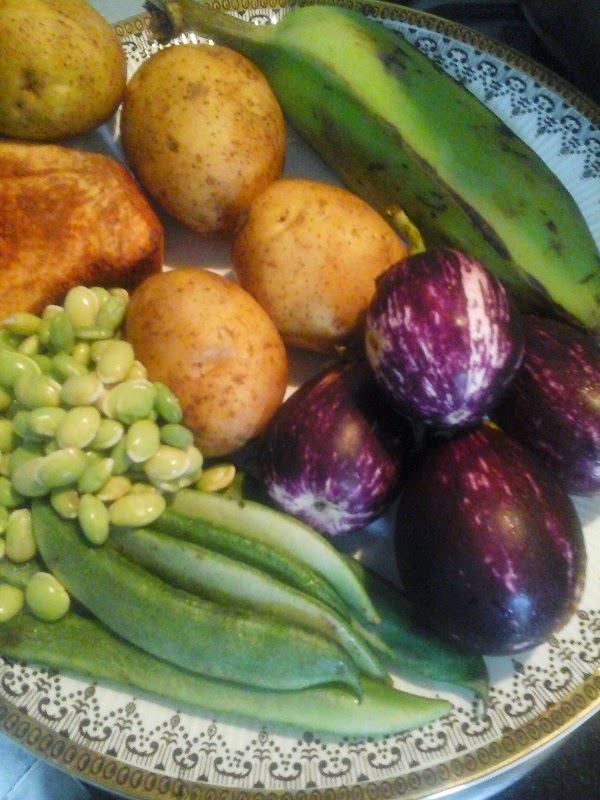 Check if the potatoes and eggplants are done. 14. If the vegetables are still not done, cook (steam )for another ten minutes or as required without the weight. 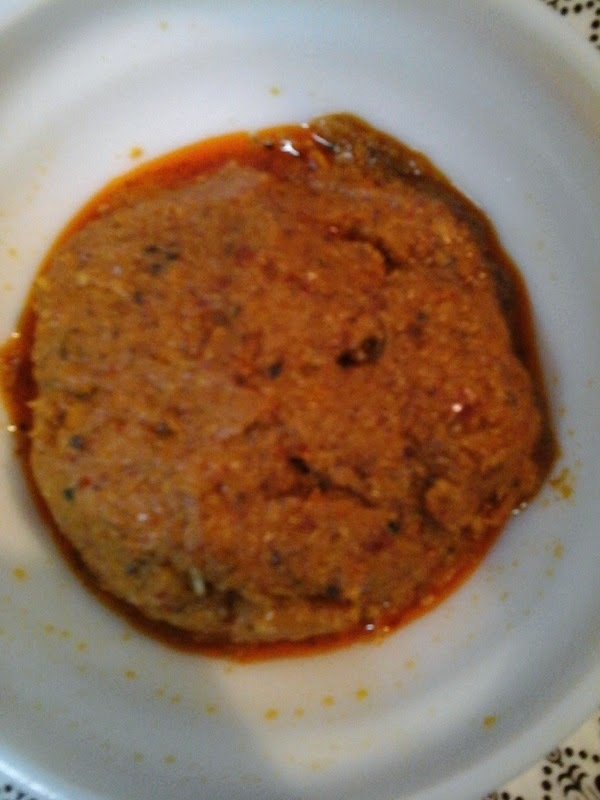 Scoop out a chunk of Undhiyu using a flat ladle on to a serving plate and garnish with a table spoon of soaked and plumped up raisins, and coriander leaves. 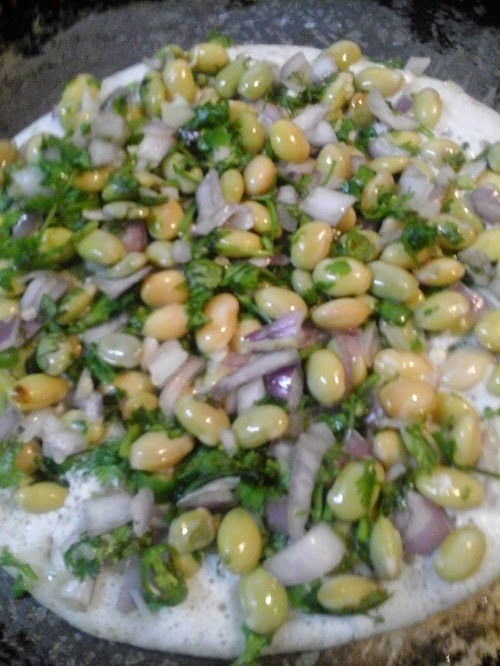 Place a few more crunchy Muthias on the side and enjoy the hot and tasty Undhiyu. Visiting the Avarebele Mela and especially enjoying the delicious Kaalu Dosae there has become an annual ritual in the family ! The dosaes are cooked on huge sizzling hot rectangular iron girdles over giant size blazing stoves . Oh ! What an awesome sight to behold ! 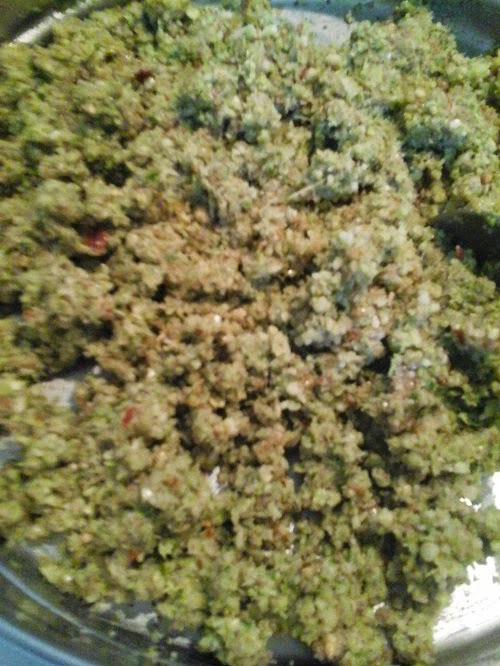 And the heavenly aroma is something out of the world ! 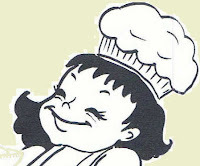 Cooking dosaes by the dozen in multiple batches through out the day is a Herculean task. 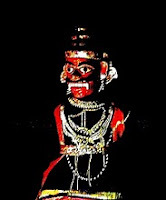 It is certainly an art which needs a lot of expertise and precision. Hats off to the nifty hands of the Dosae makers at the Mela ! After having enjoyed the flavoursome golden dosaes at the Mela , I wish to share the recipe with all the ardent fans of Kaalu through this post. Here is the recipe to make Kaalu Dosaes at home. 1. Soak all ingredients (except the Idly sooji) together for about two hours. 2. Soak Idly sooji separately. 3. Grind all the soaked ingredients together adding water into a smooth paste. 4. 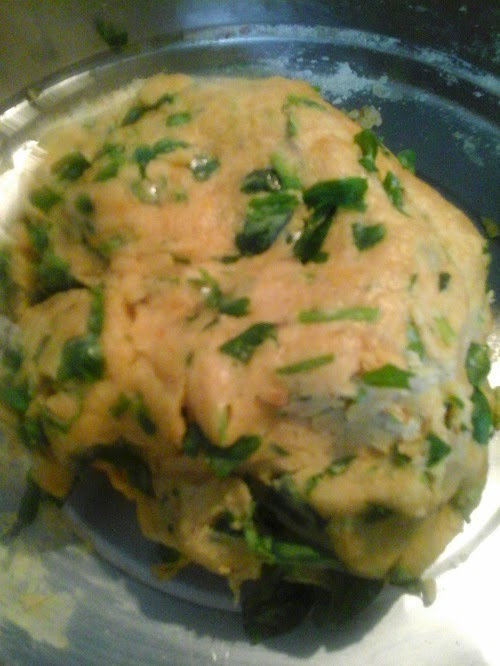 Squeeze out the Idly sooji and add to the paste and continue grinding till the batter becomes soft and fluffy adding water if necessary. 5. Mix in 1 1/2 tsps of salt and 1/2 spoon of sugar into the batter. 6. Keep the batter covered and allow it to ferment over night. 1. Boil the beans till tender . 2. Mince finely onion, green chillies, ginger and coriander leaves. 3. Mix all the ingredients with salt just before you start to make dosaes. 1. Grease a tava with ghee and heat till it hisses when water is sprinkled on it. 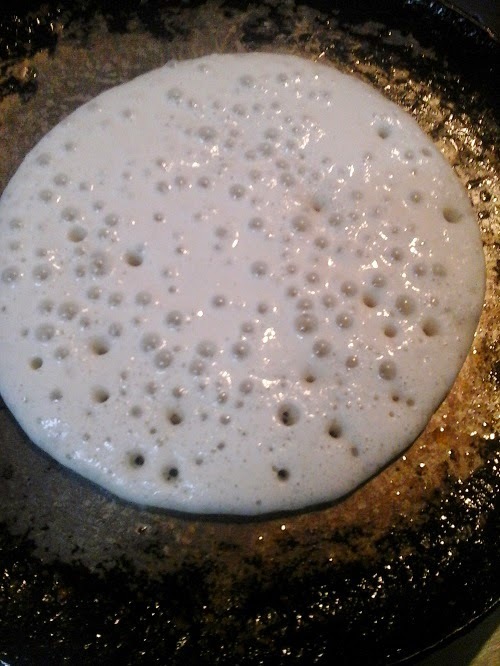 ( Iron tavas are best for making good dosaes). 2. 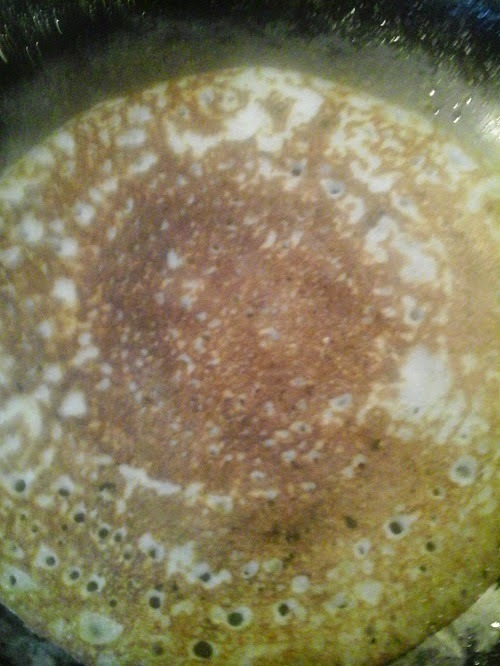 Decrease flame and pour a ladleful of batter in the center of the tava. 3. Spread it into a moderately thick dosae. 4. Wait till bubbles start appearing on the dosae . 5. Take a huge spoonful of the Kaalu mixture and sprinkle evenly all over the dosae. 6. Dribble ghee all round the dosae. 7. When the dosae is half done gently press down and embed the Kaalu mixture into the dosae. 8. When the dosae is done, gently flip it using a spatula and cook on the other side for one more minute. 9. 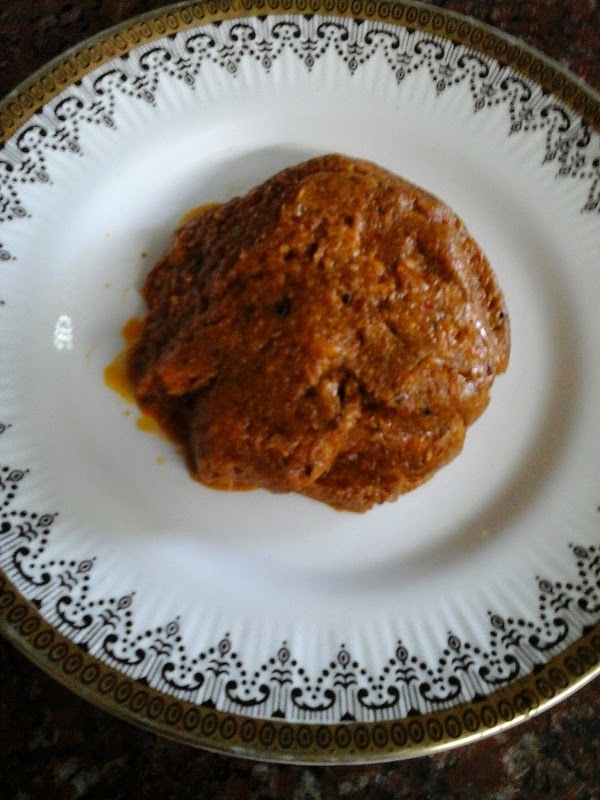 Remove the flavoursome golden Kaalu dosae on to a plate and serve with gatti chutney and sambar. 1. Blend all the ingredients into a coarse powder. 2. Add water and run the mixer till you get a thick and slightly coarse chutney. 3. 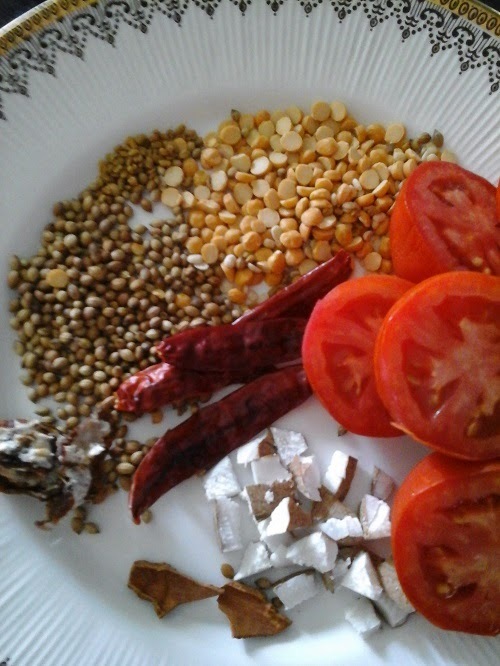 Splutter a pinch of mustard seeds in 1/4 tsp of hot oil and season the Gatti Chutney. 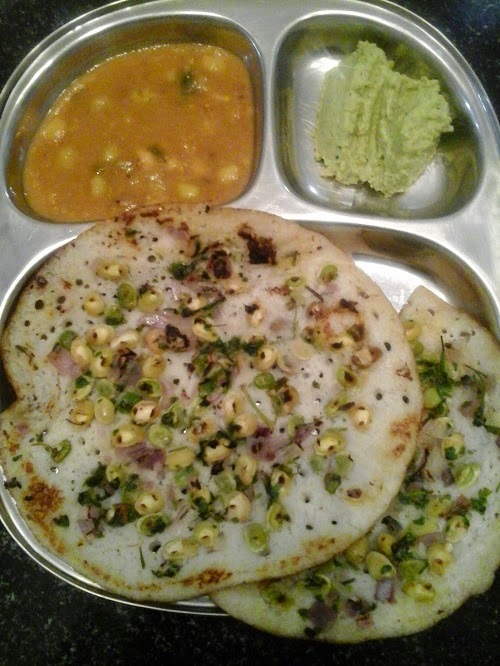 Enjoy with the delicious Kaalu Dosaes. Kumquat ? Calamondin ? Clementine ? Cuties ? I do not know the exact name of those cute , tiny and shiny Oranges sitting smug in their baskets at the super markets this winter season. They are sweet - sour to taste and have a tangy flavour. The peels are delicate and thin. My cousin is an innovative home cook who dares to try out new dishes using new techniques. Her experiments always end up with very tasty and unique dishes which we all enjoy. 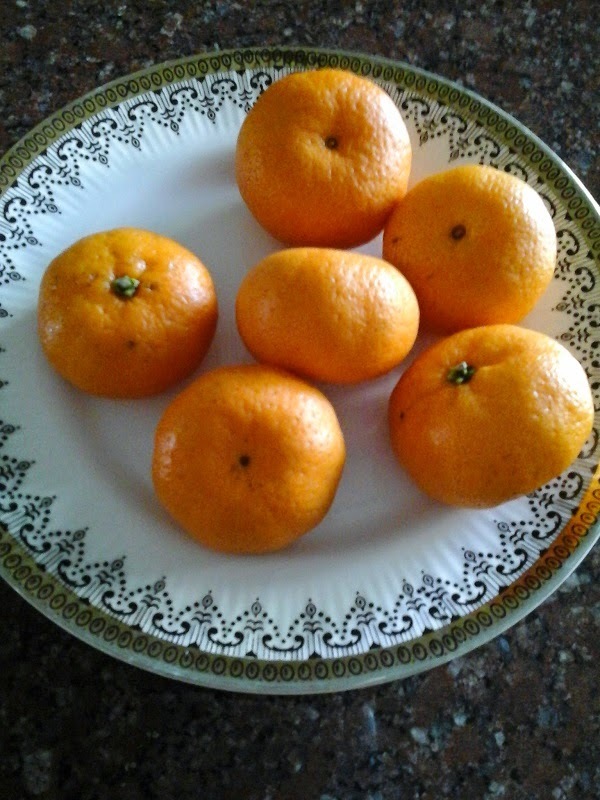 I started to prepare Whole Orange Tokku following her recipe with a slight hesitation though. But it turned out delicious and was a blessing after all the binge eating during the Christmas season. 1. Wash and wipe the Oranges and keep aside. 2. Dry roast fenugreek seeds till they turn brown in colour. 3. Add the broken red chillies and keep roasting till thy become crisp. 4. 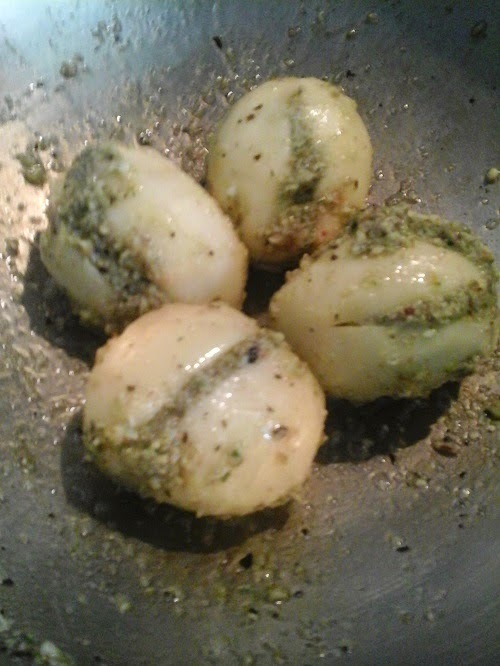 Remove the roasted ingredients into a plate when they start emanating a very pleasant aroma. 5. Heat one table spoon of sesame oil in a kadai. 6. Gently drop the Oranges into the oil and keep stirring till they are nicely fried. 7. Cool the Oranges . 9. Heat the remaining oil in the same kadai and add the mustard seeds. 10.When the mustard seeds splutter, stir in the ground Orange paste . 11. Keep stirring until the Tokku comes together and the oil separates. 12. Store in a clean dry jar after thoroughly cooling the Tokku. 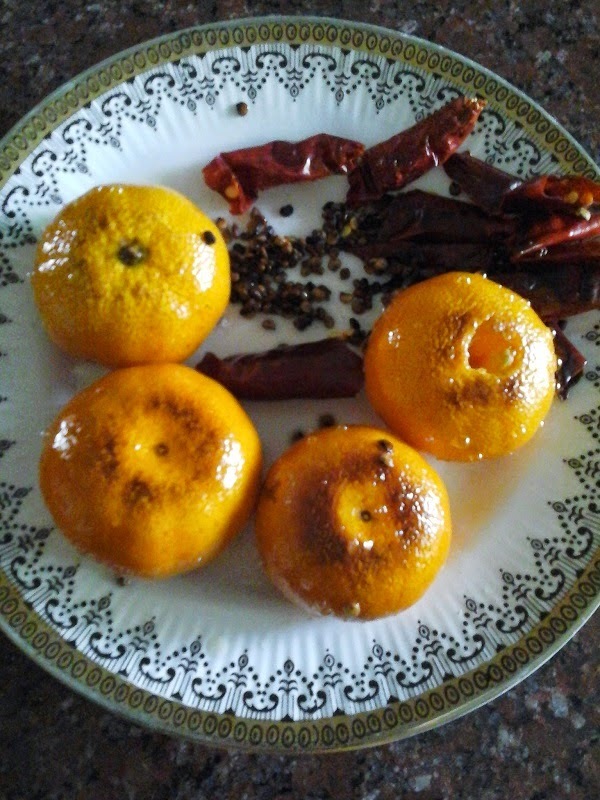 Whole Orange Tokku goes very well with dosas and chapaties. 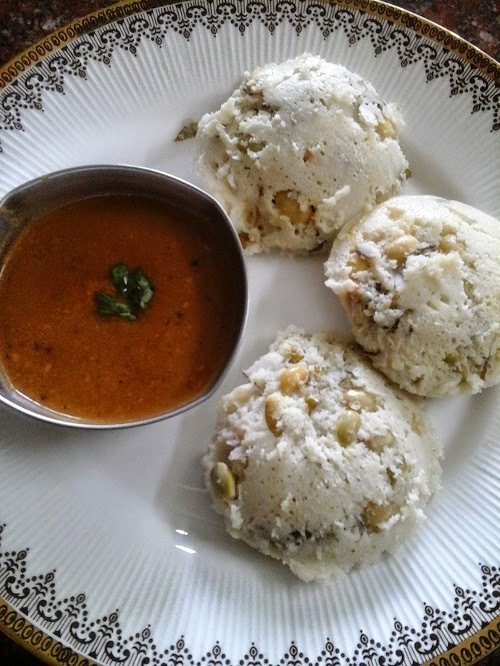 It is an ideal relish to eat with curd rice.